WOBURN -- Once again, Nashoba finds itself headed back to Gillette Stadium. Sam Bolinsky threw four touchdowns while Alex Childs rushed for 116 yards as Nashoba defeated Gloucester, 32-14, in the Div. 4 State Semifinals on Saturday night at Woburn High School. 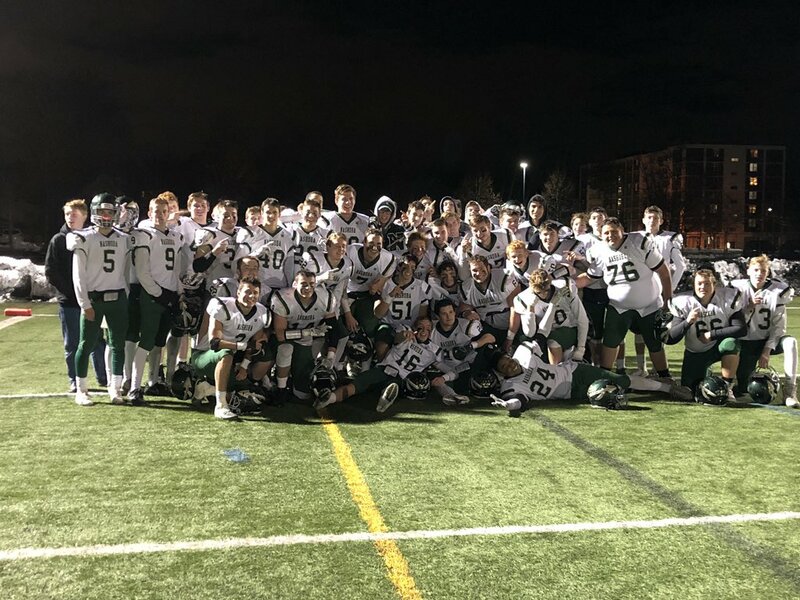 With the win, Nashoba earns its third Super Bowl appearance in four years. The Chieftains will take on Dighton-Rehoboth for the Division 4 crown on either November 30th or December 1st at Gillette Stadium. "It did not turnout our way last year, so we definitely wanted to make it back this year," said Bolinsky. "All the credit to our coaching staff. Different players come through every year and we always rebound." Behind Daylon Lark (137 yards, 2 TDs), the Fishermen built a 14-8 lead midway through the second quarter. Nashoba, however, took control from there scoring 24 unanswered points while limiting Gloucester to just 63 yards of offense in the second half. Nashoba held a slim, 15-14 advantage to begin the second half but quickly pulled away. The Chieftains required just two plays to reach the end zone on their opening drive of the third quarter with Childs rushing for 26 yards before Bolinsky (13-of-22, 150 yards) hit Will Danby for a 33-yard touchdown to put Nashoba on top 22-14. Nashoba's defensive front, meanwhile, began to make itself known on the Fisherman's ensuing drive. On fourth down and seven, Brendan Lee broke through the Gloucester line for a TFL resulting in a turnover on downs and giving Nashoba's offense a chance to extend its lead. They took full advantage. Childs ran the ball five times for a combined 38 yards and then hauled in a three-yard touchdown reception to give the Chieftains a 29-14 lead. "Our kids have done a great job," Tucker said. "Obviously we are very excited to go there again, but we start small. Win the league, get a home game and go from there. We've played three really good teams so far. Now that we've made it back to Gillette, its a great feeling." The Fisherman had an opportunity to get back in the game to begin the fourth quarter, but once again came up short on fourth down this time at the Nashoba 37-yard line. Nashoba salted the game away with less than four minutes to play with Childs drilling a 19-yard field goal to put the Chieftains up 32-14. The Fishermen scored on their opening series using their well respected rushing attack to march down the field. After three straight handoffs to begin the drive, Lark ran straight up the middle from 44 yards out to give Gloucester an 8-0 lead. Nashoba responded on its next series, going on a 14-play, 81-yard drive capped off by a three yard touchdown pass from Bolinsky to Matt Johnson to even the score, 8-8. On Nashoba's final drive of the first half, Bolinsky hit Danny McNulty in the flat for a 14-yard score to give the Chieftains a 15-14 lead heading into the locker room.